When was the last time you had your air ducts professionally cleaned? If it’s been more than a few years, then it may be time to schedule a cleaning with a reputable company. Over time, your ductwork can fill up with debris; if you don’t take the time to have your ducts cleaned, this debris can end up in the air you breathe. A professional duct cleaning will remove fine particles and debris from your home’s ductwork and ventilation system, providing you with cleaner indoor air. It’s important to hire a company that specializes in this type of work, however, as special equipment will be needed to thoroughly and properly clean out the ducts that run throughout your home. There are many benefits to having your home’s ductwork professionally cleaned. Perhaps the biggest benefit is an improvement of the health of those who live in your home. When you remove potentially harmful particles and debris from your home’s ventilation system, you can enjoy better indoor air quality. This is especially important for those who have allergies or asthma, as the removal of this debris can make it easier to breathe and even alleviate some of those persistent symptoms. 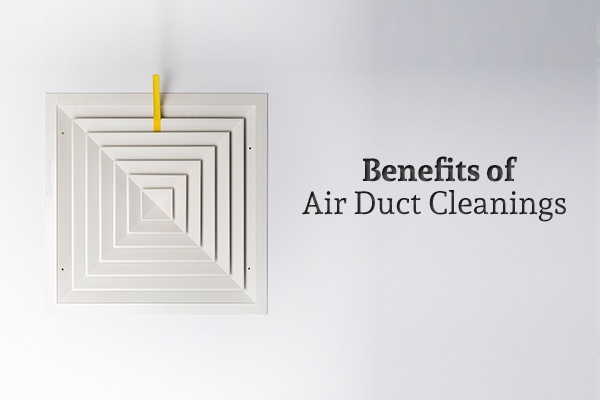 In addition to being beneficial to your health, air duct cleanings could make your life easier. That’s because, with less dust and debris in the air, you may be able to save time on your routine cleaning tasks, such as dusting furniture. You may find that you don’t need to dust as often to keep your home looking its best. You may also find that your home smells fresher, and that unpleasant odors or smells have disappeared after a duct cleaning. Last but certainly not least, a clean ventilation and duct system could help your home’s HVAC components run more efficiently. That’s because you won’t have any build-up of debris and dust along your home’s air return registers, vents, and ducts. As a result, air from your furnace and air conditioning units will be able to flow more freely from one room to the next, helping you maximize your home’s efficiency. Not sure whether or not your home is due for a professional duct cleaning? There are a few telltale signs that indicate it may be time to schedule an appointment. For starters, if it’s been more than a year or two since your last cleaning or if you can’t remember the last time your home’s ducts were cleaned, then it’s probably time. The same goes if you just bought a home; having ducts cleaned as part of your pre-move in cleaning tasks is always a good idea. Furthermore, if you can see dust or other debris accumulating along air return vents and other registers throughout your home, there’s a good chance you have a large amount of debris built up throughout your home’s hidden ductwork as well. Vacuuming off the outsides of the vents and registers may make them look cleaner, but you probably still have a significant amount of debris looming within the ducts that needs to be professionally removed. Finally, if you’ve recently been noticing that you’re coughing and sneezing more, or that you’re having other issues with your respiratory system, this could be due to poor indoor air quality caused by dirty ductwork. A professional cleaning could be just what the doctor ordered. Of course, it’s always a good idea to consult with your physician any time you experience these kinds of symptoms. Are you convinced that it’s time to schedule an air duct cleaning in your home? If so, then you may be wondering how to find the right professionals for the job. When hiring a duct cleaning company, make sure to check their reputation and experience. You’ll also want to check and make sure that the company coming out to your home has the equipment needed to do a thorough cleaning. Taking the time to read online reviews and testimonials can give you a better idea of whether or not a particular company is right for the job. Overall, having the air ducts in your home cleaned once a year is a good idea. If you’re ready to schedule an appointment for duct cleaning at your home near Denton, TX, Cote’s Mechanical Heating & Air Conditioning is here to help. Contact them today to schedule an appointment or to find out more about the many services they offer.